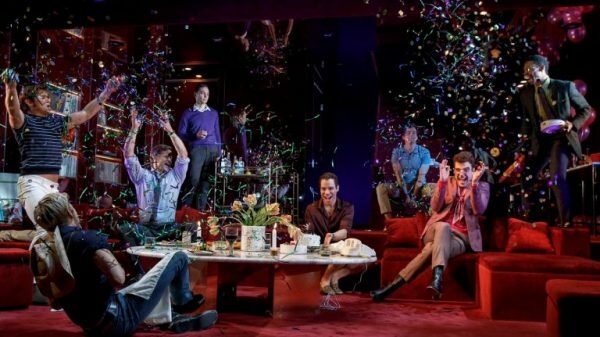 When The Boys in the Band, Mart Crowley’s groundbreaking play focusing on the gay experience, opened Off-Broadway in 1968, critics praised it as a sympathetic portrait of a persecuted sexual minority. But many reviewers tellingly revealed their bias. One expressed disgust at having to watch men dance together while another described the work as an accurate depiction of those suffering from a disease. 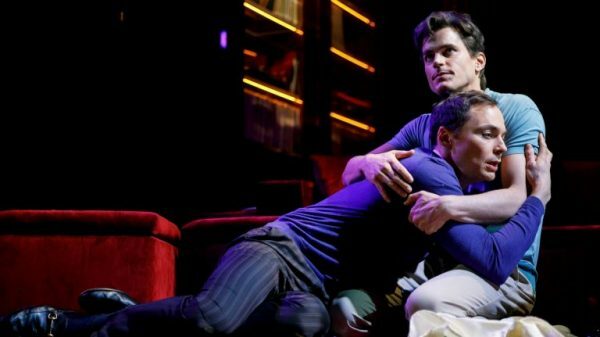 The current revival at the Booth of this devastating artifact—the first one for Broadway after two major Off-Broadway stagings—shows how far we have come as far as gay acceptance goes. 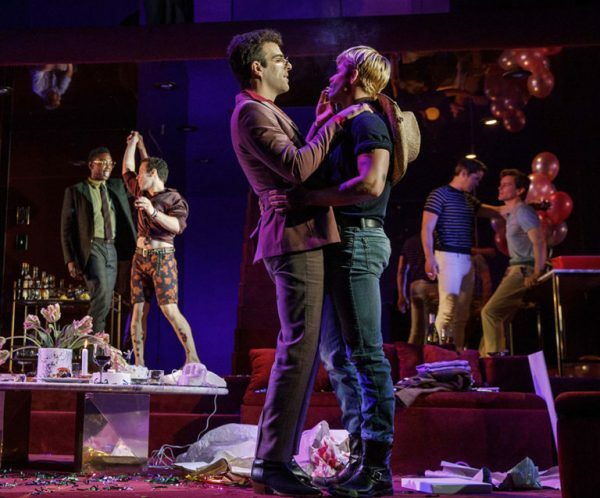 The director Joe Mantello, all of the producers, and the entire nine-man cast are all openly gay and have not suffered any career damage. Jim Parsons and Matt Bomer in The Boys in the Band. The acting and direction are strong and precise, Crowley’s bitchy wisecracks are dropped like nasty bombs exactly on target. But, like George C. Wolfe’s surface-deep rendering of The Iceman Cometh a few doors down at the Bernard Jacobs, this production settles for easy laughs and fails to offer the full depth of the first production, preserved in a 1970 film version with the original ensemble, directed by William Friedkin. 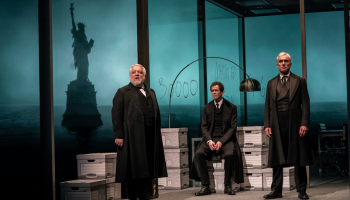 Crowley has trimmed his script and eliminated the intermission and Mantello delivers his usual tight pacing, but it feels as if we are looking at these boys through the prism of 2018 sensibilities rather than directly experiencing their pain and loneliness. 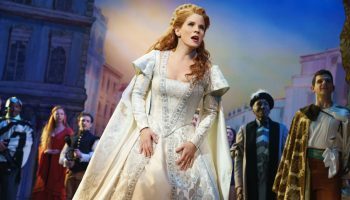 The concept is ingeniously theatrical and accounts for the original’s smash run of 1,000 performances. A group of funny-on-the-outside-sad-on-the-inside gay friends gather for a birthday party, but a wild card is dealt when the supposedly straight college friend of the host shows up and all bets are off. A Who’s Afraid of Virginia Woolf-style party game forces the guests to reveal bitter secrets and each somewhat stereotyped figure is stripped metaphorically bare. The cast of The Boys in the Band. The attitudes towards gays at the time—reflected accurately in the script—ranged from outright repulsion to condescending pity. None of the partygoers is in a healthy relationship and the object of their game, engineered by the self-loathing host Michael, is to expose the impossibility of romantic love between men. (Each player must telephone the one person they have truly loved and tell him so—a bold challenge to express the passion that dare not speak its name.) In 1968, homosexuality was seen as a curse, not a healthy state of being. Mantello’s sharp direction does not touch on this theme, but does offer plenty of yucks and attempts at pathos. At times, he pushes the melodrama, such as freezing the action and throwing a spotlight on Michael as he takes his first cocktail of the evening as if to shout at the audience, “Look out, dramatic fireworks ahead!” But his choices are rarely this blantant. Jim Parsons deserves kudos for his caustic Michael, a notoriously difficult role which the lovable Big Bang Theory star tackles with conviction despite a fall during previews. He wisely does not water down Michael’s venom, but he misses his fathom-deep anguish and anger. The latter half of the play is usually stolen by Harold, the acerbic birthday boy who is given the lion’s share of biting barbs and is Michael’s equal when it comes to powerful put downs. Unfortunately, Zachary Quinto plays Harold on one affected rumbling bass note, sort of like a cartoon villain. Michael Benjamin Washington, Robin de Jesus, Zachary Quinto, Charlie Carver, Andrew Rannells, and Matt Bomer in The Boys in the Band. 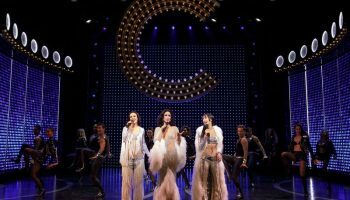 Robin de Jesus reveals the ache beneath the effeminate clowning of Emory, the “nelly queen” of the bunch. Matt Bomer is relegated to reacting to the others’ excesses as Donald, Michael’s sometime lover, but he makes the most of it. Michael Benjamin Washington, Andrew Rannells, Tuc Watkins, and Brian Hutchinson complete this proficient ensemble. Even Charlie Carver in the small role of the cowboy-hustler bought as a gag gift for Harold, has moments to shine. David Zinn designed the appropriate period costumes and the red-velvet duplex apartment set which gets a trifle crowded. But the split-level effect is employed cleverly by Mantello. 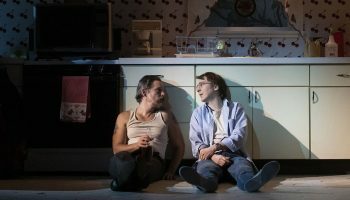 With the aide of Hugh Vanstone’s lighting, he uses mirrors and glass panels in a technique similar to the one in his staging of Edward Albee’s Three Tall Women, a revival which, unlike this Boys, fully mines the depths of its source. May 31—Aug. 11. Booth Theater, 222 W. 45th St., NYC. Mon 8pm, Tue 7pm, wed 2pm & 7pm, Thu—Fri 8pm, Sat 2pm & 8pm. Running time: one hour and 45 mins. with no intermission. $69—$199. (212) 239-6200. www.telecharge.com.